It looks like we weathered Sunday’s storm well…bringing in cooler temperatures and a steady breeze. We were glad so many were able to join us for our AGM on Sunday morning after that wonderful display of waffles and pancakes and fruit, thanks to Mark Gienow and his staff!!!! Please notice the new Nature section in the right hand column. Because of so much interest in the nature articles, we thought it a great idea to keep the sounds and videos close at hand! Let me know if there are other animals/birds/insects you’d like to know more about. The Loon’s call is ever prevalent here in Pointe au Baril. Have you ever wondered what the various calls represent? Take a listen. 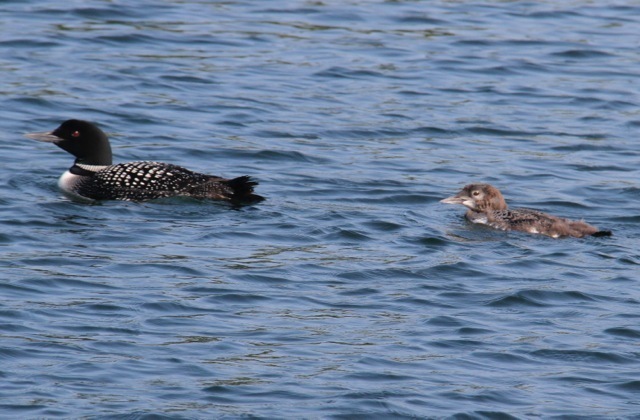 Want to learn more about the Loons? Then watch this Loon Video! 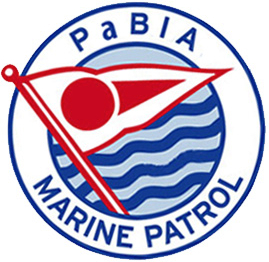 For anyone who would like to take the boating test to receive their boating license can do so by signing up either at the Marine Patrol or the Ojibway offices. Randy Johnson can be contacted for further details or questions. These tests are given in the Ojibway lounge or dining room, depending on the space available. There is a cost associated with this. Should you pass, you will receive a temporary license that day, the permanent one to be sent to you. Excessive Speed in Narrow Channels It has been brought to our attention that boaters continue to speed through narrow channels. In particular, recent complaints have arisen regarding excessive speed through UGO-IGO channel by multiple PWC’s. Whether you drive a 12 foot tinny, a PWC or a Grady White, all boat operators should be clear on the rules governing our waters in Ontario. If you are 30 metres or 98.43 feet from shore, all boats must operate at a safe operating speed for fellow boaters.A good rule to observe is the 10kph speed limit and this allows you to manage your wake at all times. If we apply this principle to our water-based community, think of how many channels would be appropriate as we try to squeeze boat traffic through at speed. If any cottagers notice dangerous driving in narrow channels, we urge you to take a picture of the offending boats and note down the hull numbers. A call to the OPP would be warranted if a person is endangered or there is property damage due to excessive wake. We have received a complaint and several comments on how boaters arrive and depart The Ojibway Club docks. Our observations have confirmed that many boats approach the docks too quickly and boaters are not yielding right of way. The rules of navigation apply to all boats arriving and departing public docks. If two boats approach each other, the boat on the right of the two boats has the right of way. In other words, if a boat is approaching on your left, maintain your course and speed with caution, and if a boat is approaching from your right, keep out of its way. If a boat is overtaking another boat, the boat in front has the right of way, and the overtaking boat must stay clear of the boat it is passing. Passing on the right is preferred. 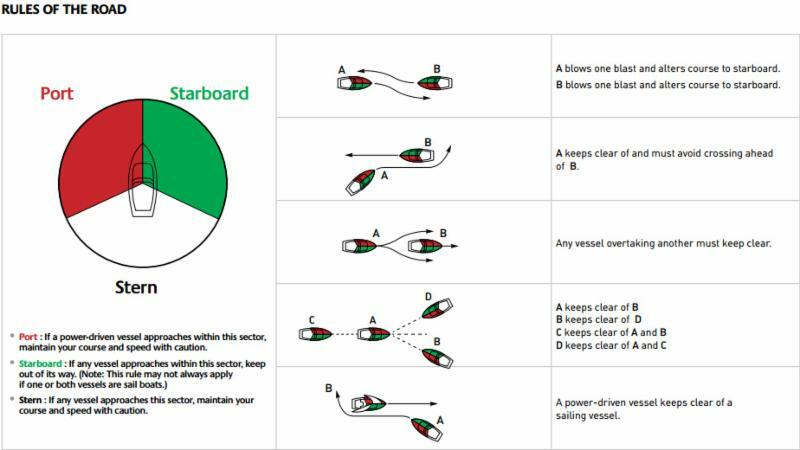 We hope this assists all in applying boat courtesy on our waters! Here are the Rules of the Road. In its continuing efforts to keep you all informed and reach the broader PaB community, the Ojibway Historical Preservation Society is excited to announce the launching of its new website. The new OHPS site provides historical background, archival photos, records, descriptions on current restoration projects, interviews of local personalities, contact information, map of the expanding walking trails and much more. Check it out and let us know your thoughts and any other features you would like OHPS to add as we follow our plan to enhance the site with further historical memories and documentation as they are researched and uncovered. Contact Terry Clark, President OHPS, with any questions or comments. 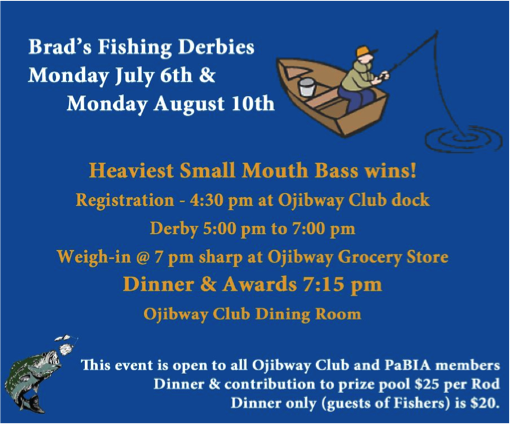 The first Derby on July 6th was a fantastic event with the big winner catching a large smallmouth bass. There will be a dinner right after the event @ 7:15 p.m. Please make it a point to come join the fun. To ensure that you have a place at the Fisherman’s award dinner ($20/person), please email the Ojibway Office to sign up or stop by. Ken Williams and Gary French will again be available to chat with you about any Township matter you wish to discuss with them. They will meet you from 10:00 a.m. – noon at the Ojibway Movie Hut. So bring your questions and hear from them. We had an action packed weekend with Jr. PaBAR on Sunday just before the big storm. 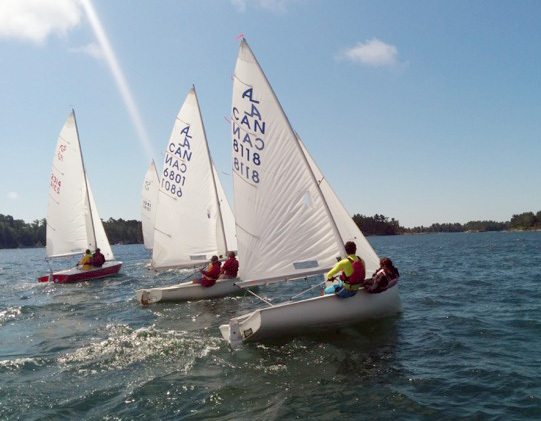 Our weekly race was postponed to Monday for 2 fabulous races in Matthews Bay with a great turnout. Congratulations to our Jr. PaBAR winners; Jamie ‘t Hoof and Ollie Clyde in the Albacore class and Keesje ‘t Hoof in the Laser class. Thank you to our rendezvous hosts, Glyn and David Austin, who kindly delayed the rendezvous until Monday and provided us with a wonderful party at their lovely cottage. Our next race will be held on Saturday August 8th at 2 pm on the Lighthouse Race Course. The Rendezvous will be hosted by Kim and John Hassard at Oneeishta Island (A244). Check the PaBIA website for course descriptions, race results and other pertinent information. PaBAR will take place on Saturday August 15th. The annual PaBAR and Sailing Awards Dinner will follow in the evening. Contact the Ojibway Club to reserve your seats for this fun night. The new, limited edition Marine Patrol hats are available as of this Saturday. The latest colours are black and white in micro-fibre material to keep your melon cool! 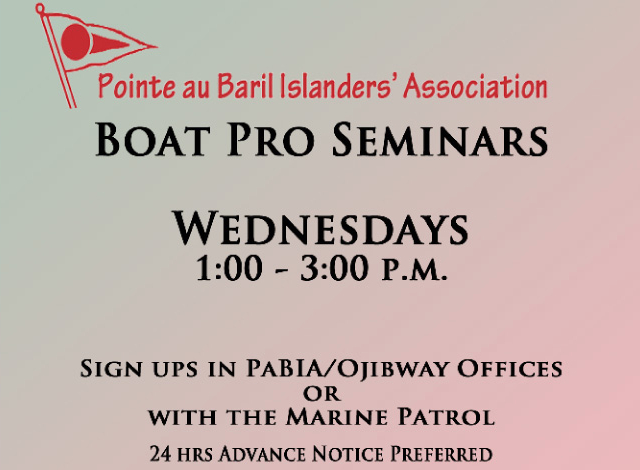 Come to the PaBIA office on Ojibway Island between 8:30 and 9:30 or 4 to 5pm except Wednesdays. Or write a message to the Patrollers on the whiteboard hanging on the door. Or better yet, email the Marine Patrol. Support your local Marine Patrol! John Hewgill, A385 ‘Ugo Igo Is.’, husband of Jennifer Rogers, step-father of Kara McIntosh (Jeff Taylor), Ryan (Alison) McIntosh, Jeremy (Rebekah) McIntosh, July 2015.